La Dolce Vita: Can you believe it's already December? Where does the time go? I feel like June was just yesterday and here we are, December 1st. I'm not in the holiday spirit just yet, but it should help that Fabian hung our Christmas lights this weekend. I'm hoping to decorate the inside of the house and get our Christmas tree up in the next week or so. Have you all decked the halls yet? What does your timeline look like? 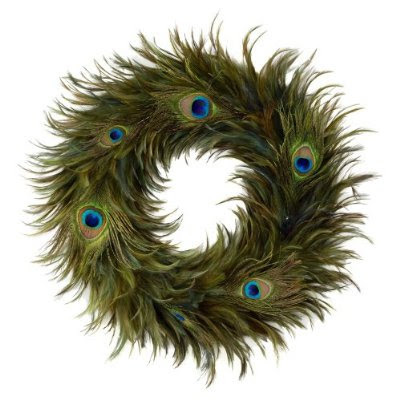 Fabulous Peacock Feather Wreath from Target via Ciao Tay. Hopefully this cooler weather will help you get in the Christmas spirit! Supposed to get below 40 tonight! We wanted to start this weekend, but we had rainy weather so it will have to wait till next year. I want to get garland to go around my front door. You are so crafty Courtney. I can't believe you made the garland yourself. How do you even go about doing that? I love the peacock wreath! My married last name means Peacock in Italy and I have a sudden obsession for them lately. I must go pick one up. We started this weekend decorating inside. We're getting a real tree tonight, and hope to get the outside lights up this weekend (it should be warmer). Happy Holidays!